I’d been on the road for little more than sixty minutes when those first flutters of road trip excitement started to kick in. In that short time, my travel buddy, Shawn Ogulu, and I had zipped past rush-hour traffic slowly edging its way into the Cape Town CBD, caught a quick glimpse of Table Mountain , the harbor, and False Bay bathed in early morning sunlight, and had just rounded the summit of the epic Sir Lowry’s Pass. It wasn’t the panoramic views back over the Cape Flats that elicited the excitement, but rather the promise of what lay on the other side of the Hottentots Holland Mountains. 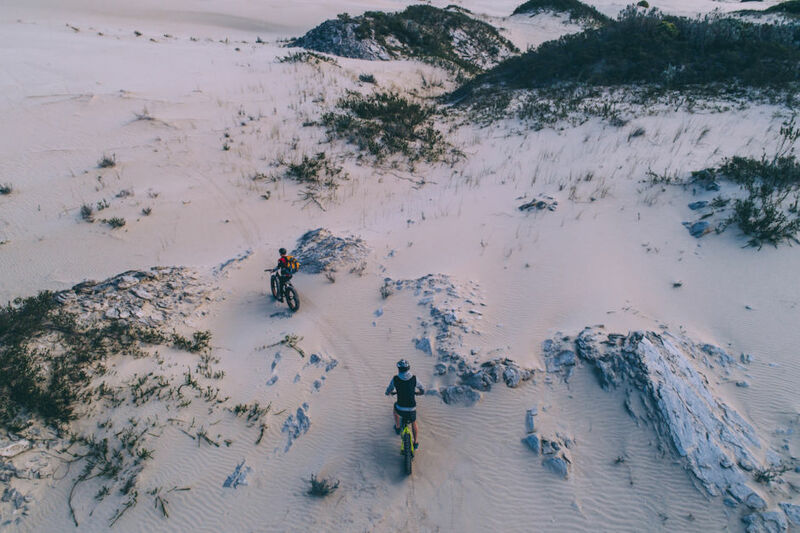 Over the next five days, we’d be exploring the small backroads, popular towns, and undiscovered gems of the Cape Overberg region. Cape Town is one of the best self-drive destinations in the world. There are several routes threading their way towards and over the surrounding mountains, and also north and east along the coast. 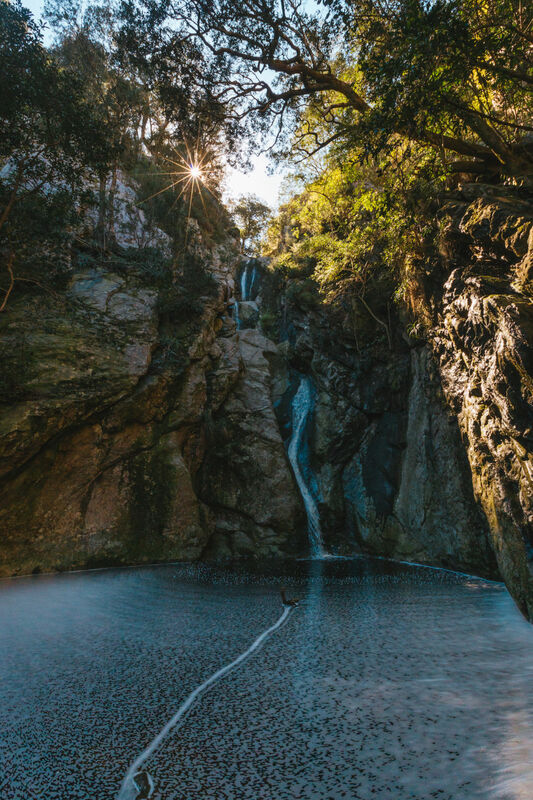 It’s also the most common starting point for the famous Garden Route, which attracts thousands of road trippers each year. But this time, we’d be stopping well short of the Garden Route’s official starting point. 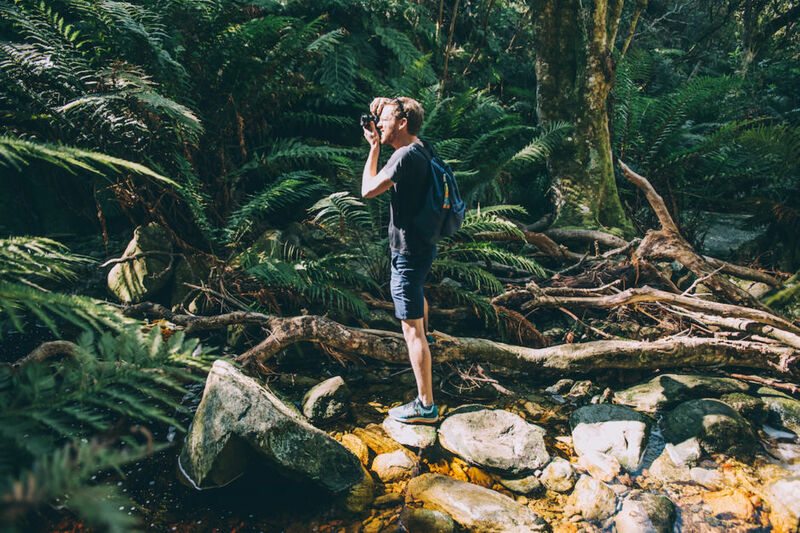 We were heading off to explore one of the most often-overlooked regions of the Western Cape. I woke up early at the grandiose Thatch House, parted the heavy curtains, and stumbled onto the balcony to find this remarkable view across the Klein River Lagoon, just outside the popular coastal town of Hermanus. By the time we reached the head office of the Cape Canopy Tour, a light drizzle had begun to fall. 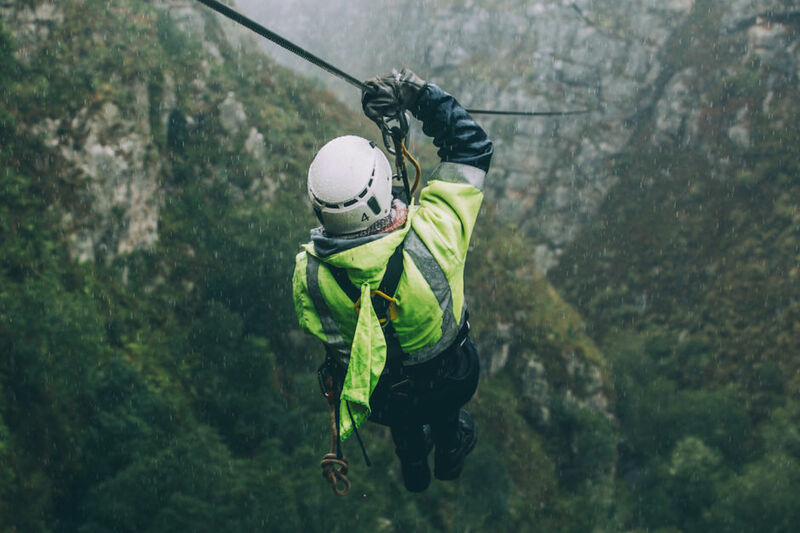 Once we’d kitted up, boarded the open Land Rovers, and driven our way up through the previously inaccessible reaches of the Hottentots Holland Mountains, the light drizzle had turned into torrential rain. Over the next three hours, we careened between small platforms high above rivers, waterfalls, and vast tree-lined valleys. The rain hit our faces so hard it stung, it became difficult to see, and it soon soaked through our waterproof jackets. And yet, in spite of the conditions, or perhaps because of them, it was a truly remarkable experience. 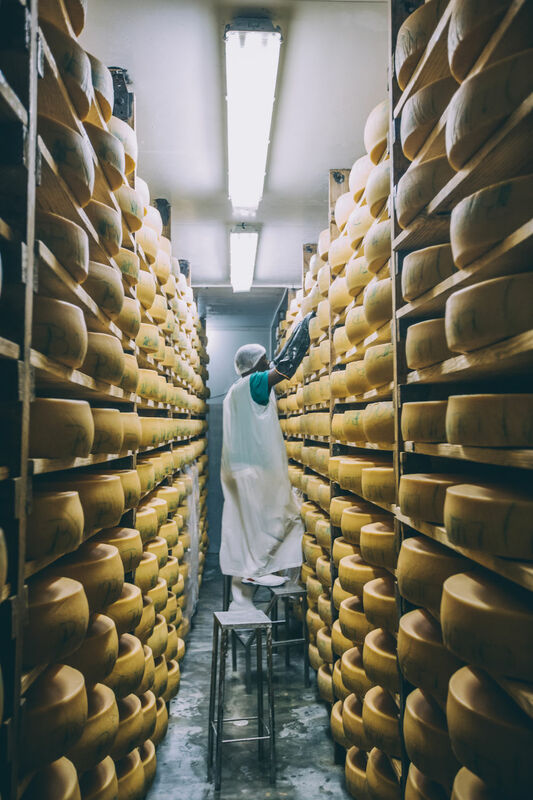 On the outskirts of Stanford, we found a small, understated cheese factory called Klein River Cheese. In spite of its warm, homely atmosphere, a quick glimpse behind the scenes taught us that this is an impressive operation that supplies several of the country’s largest supermarkets. A tasting platter outside, which included a simmering Raclette fondue, revealed why many consider them among the most sought-after cheese producers in the country. In the hills above Stanford, we explored a wine estate, restaurant, and protea plantation. 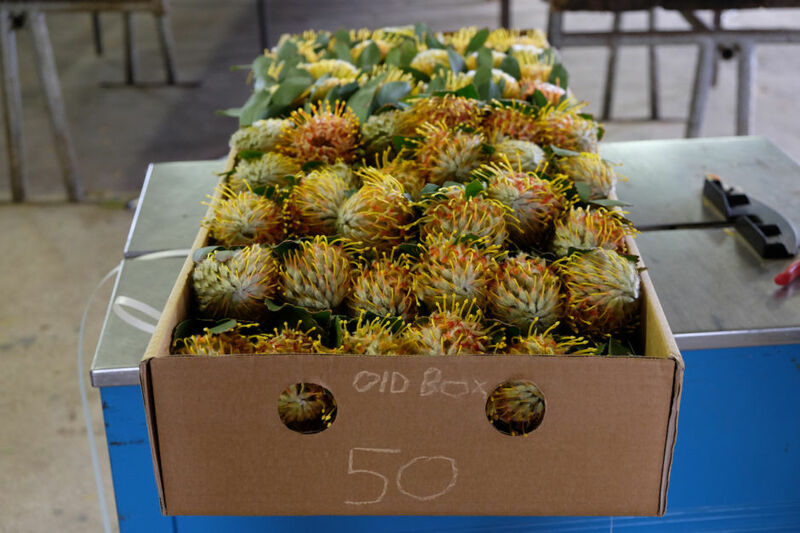 Boxes of fifty Pincushion Proteas like these, the Stanford Hills owner told us, travel from this remote farm to leading flower markets around the world. Tucked beneath the dunes we found this wild, secluded beach that could easily have been in Portugal’s Algarve. Instead, it was in the small Great White Shark haven of Gansbaai. 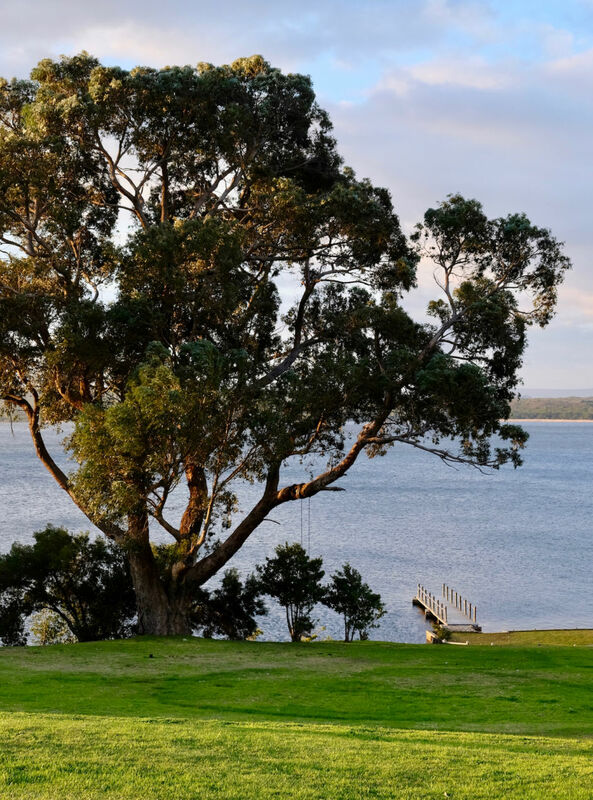 Just a few hundred meters from the southernmost point of the African continent we found this quiet, natural harbor. 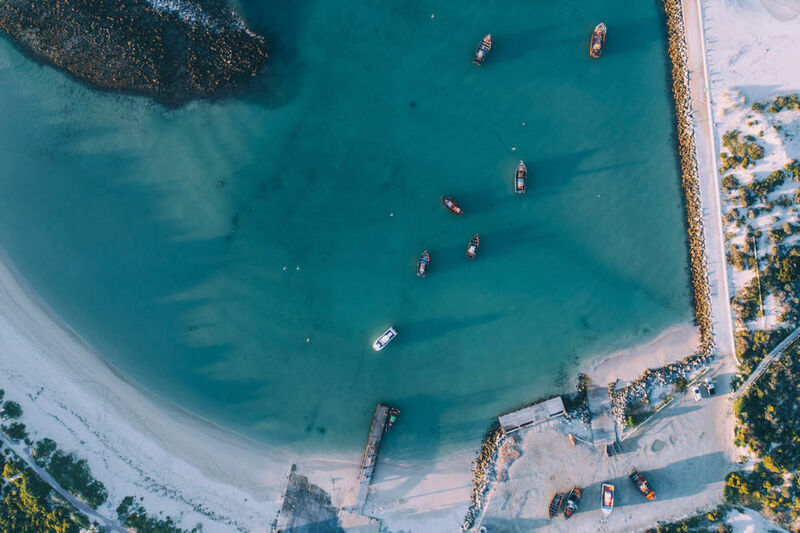 Used primarily by local fisherman, there were just a few weathered boats bobbing in the calm, turquoise water, and it felt as if little has changed in those parts since it was first established. As the sun set over the harbor, the ships’ shadows grew longer in the water, we launched a drone to witness the location from above. 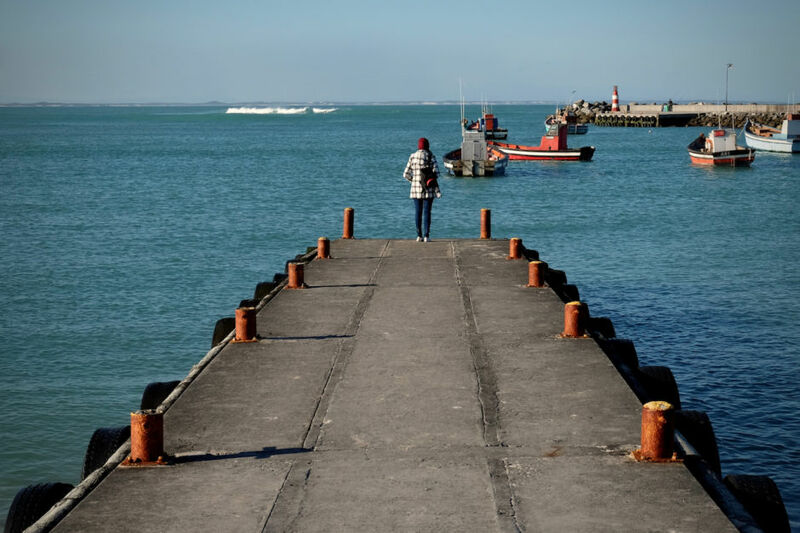 Seagulls squawked overhead before settling down for the evening, and a new sense of calm descended on the already tranquil Struisbaai. 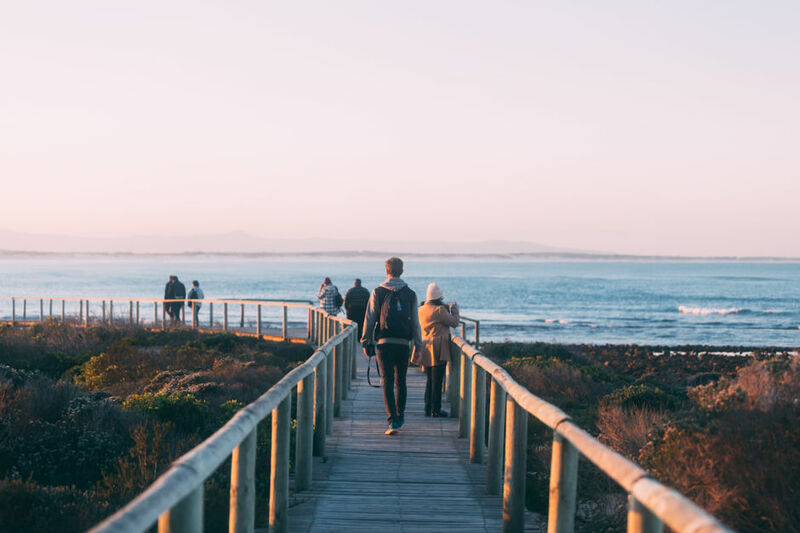 On our last evening, we took a walk along the scenic boardwalk above coastal fynbos, with the waves of the Indian Ocean cascading gently to our right, which served as the perfect time to reflect on this whirlwind visit to one of the most remarkable parts of South Africa. Before heading home we made a quick detour to Swellendam and nearby Marloth Nature Reserve. There we hiked a well-maintained path through the forest among emerald green ferns and a trickling river that we were told lead to a waterfall just a few hundred meters higher. After an hour of walking alongside the river, we found the falls — as tranquil, pristine and unspoiled as we’d been promised. Eventually, we hit the open road to return back to Cape Town. In spite of the food, wine, and endless adventure, there was one constant that strung it all together — the panoramic Overberg views such as these.